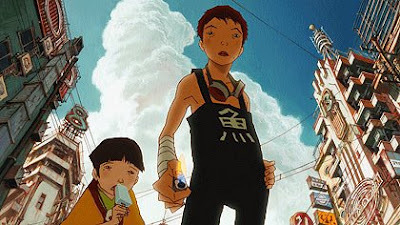 Recently watched Tekkonkinkreet with my wife and must say I really didn't expect it to be as great as it was from the onset I thought oh this isn't my sort of animation style and oh this is gonna be another one of those mindless anime's that's got no real story and is just fighting. How wrong I was I quickly fell in love with the anime I even like the animation style it seems to suit the story, basically its about two friends called black and white both are homeless and live in an old rust bucket of a car, black has always protected white since he was young and they both protect a part of the city called Treasure town from any sort of outer influence whether its other town gangs or the Yakuza. When the Yakuza start moving back into the area is when all the trouble starts and black and white need to do there best to defend there city, although after white gets injured and taken away from black is when the show becomes great black is now out for revenge and the story starts to become pretty dark and twisted, black starts to lose all form of humanity as he seeks revenge he falls more and more into the dark with white being the only one that has his "screws" as white likes to say. The story becomes a battle of black trying to stay away from becoming purely evil and white trying to gain his own screws back to saves blacks. The show has many interesting themes that we can all take away, we all have a dark side and we all must battle with ourselves at one time or another, and even the innocent have there twisted side as we see with white and having great friends/family can help us keep grounded. To sum up an excellent anime highly recommended to any anime fan and none anime fan alike, a surprisingly deep, twisted at times anime, if you can get past the different style of animation I'm sure most of you will find a gem of a show.